A peal is a change ringing method rung to 5000 or more changes. At Ecclesfield the average time it takes to ring 5000 changes on all 10 bells is about 3 hours 5 minutes. It is possible to ring a Peal on 6 instead of 8 or 10 bells and this has taken place sometimes. On 6 bells the maximum number of changes possible (the extent) is 720 so the 720 must be rung 7 times to give 5040 changes. The rules for a Peal include; no change must be repeated, each ringer must ring the same bell continuously all the way through, no help to be given to the ringers by anyone not ringing, no use of memory aids is permitted, it will start and end in rounds and not have stopped at any point. The earliest record of a peal at Ecclesfield is one rung on 6 bells on 15th May 1843. The second earliest recorded peal was rung on 8 bells on 28th May 1845. The number of bells in the tower was increased from 6 to 8 in 1845. This was the first peal on the 8 bells and was reported in the Sheffield and Rotherham Independent, (24.v.45). The last Peal on the eight bells before augmentation and refurbishment was rung on 5th September 2011 which was 166 years after the first, more information. The 100th peal was rung on the morning of 24th November 2012. A carved stone tablet on the wall of the ringing chamber records a peal rung in 1850. The Tenor weight shown is wrong, the Tenor at this time actually weighed 14.3.16. The carved stone on the ringing chamber wall. The total number of peals rung at Ecclesfield now stands at 128. Most of these have been rung by members of the Yorkshire Association of Change Ringers (YACR). 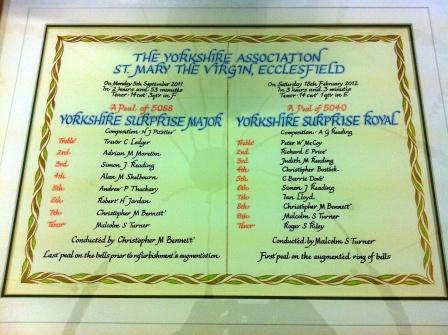 The Ringers at St Mary's are members of the Sheffield Branch of the YACR. A database of peals rung at Ecclesfield and all other towers can be viewed by using this link to the Felstead Peal Database. Ringers also ring peals as a personal and team challenge to test their mental and physical powers by ringing methods to at least 5000 changes. A peal cannot be counted if something happens that causes it to stop, go badly wrong, a change is repeated, or the ringers lose their place in the method. Some other reasons for a lost peal are, illness, ropes breaking, faults with the bells, conducting faults, everyone goes wrong, the method is false and there are many others. Peals have occasionally been lost through someone coming in to the tower, talking to and distracting the ringers. For this reason, ringers will sometimes lock themselves into the tower for the duration of the peal attempt. Both peals and quarter peals are published in the weekly ringers magazine - 'The Ringing World'. This is a national publication that has news about all things bell ringing. It is taken by many ringers and a copy can be found in most towers. The Ringing World lists the tower at which the peal or quarter or peal was rung, who rang the bells and the reason for doing it. It is a way of recording your achievement for posterity. We welcome any requests from visiting bands of ringers who want to ring peals or quarter peals at St Mary's. Please contact us by e-mail at: ecclesfieldtower@hotmail.co.uk to make a booking.